sensible producers that have terroirs on cold, calcareous soils with great exposition. One such terroir is Grand Cru Engelberg in the north, 20 km due west of Strasbourg. 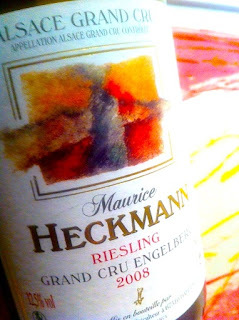 Here producers such as Heckmann, Pfister, Bechtold, Schmitt and Loew produce wines with a low-key and food-friendly balance, freshness and complexity. 2008 Riesling Grand Cru Engelberg by Maurice Heckmann in Dahlenheim is deep yellow. The aroma is developed and generous with lemon, mango, toast, white raisins and the pleasant notes of petrol that one often finds in this wine. The taste is medium bodied and dry with succulent fruit and a superior, zesty and mineral adicity that adds great qualities to this honest wine. Price: €9.